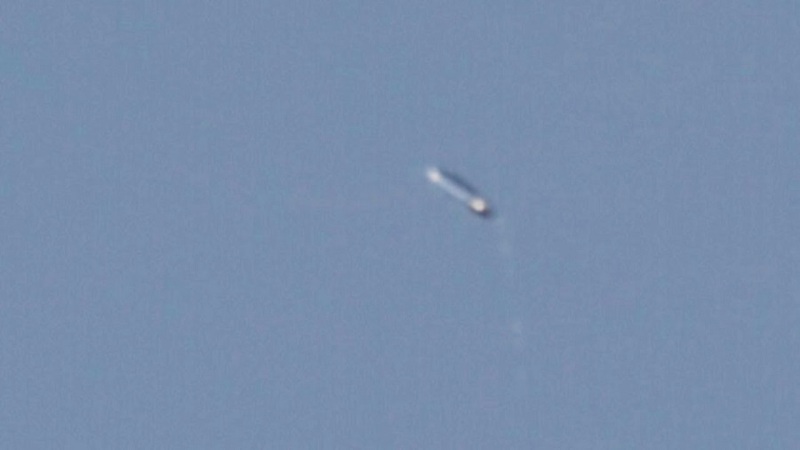 Photographer Bret Jones shared a video to his YouTube channel recently that shows an unidentified flying object he captured on camera while out looking for birds to photograph near Greensboro, North Carolina on January 25th. Yesterday while walking around outside looking for birds to film and photograph I noticed a strange flashing light in the sky near an airplane. It was moving slowly in the sky, a little slower than the planes flying around. I could see the random flashing coming from the object for about 10 seconds. I tried to film it with my camera. Using my GH5 and Leica 100-400mm lens I was able to grab a few frames of the object. I did not think I captured it at all because the focus would only hunt and not lock on. When I got inside and checked the footage I was blown away by what I saw. I have no idea what this object is. It is pill shaped with bullet headed ends. This is in rural North Carolina just outside of Greensboro. Enjoy the video and let me know if you have any idea as to what this object is. Jones also included the relevant technical details for the camera he was using. Thought I was shooting 1/1000th shutter speed but heat of the moment probably knocked it down, or video recording mode automatically knocked it down. The meta data does not lie. Used the Daylight Linear GHAlex lut and changed gamma to bring in as much detail as I could. "I just saw this flash in the corner of my vision. I look over and there's a plane and I saw the flash again, but it was just near it. I already had my camera strapped to me and I started trying to capture it," Jones said of his sighting. "I told my wife I just saw a UFO and she said 'oh yeah, again?' but then I look at the video and scroll and I was just like I have no idea what that is!" "Frankly, it looks like an oblong balloon coming into and out of focus. the object seems to be tethered, not dropping material, because the 'string' is taut and clearly restricting the movement of the object," one viewer commented. "Also the way the flashes seem to resolve in frame when the object 'appears.'" Balloons made from mylar and other reflective substances can catch and reflect the sun’s rays. Such a balloon might seem to flash, or even appear and disappear, depending upon whether or not it is currently reflecting light towards its observer as it spins. But a few believers said they’d seen something similar, and at least one of the sightings was at night when a balloon catching the sun wouldn’t work as an explanation. "I live close to Greensboro. I have seen this flash at night for the past year now. I have taken a few photos and barely caught it on video once. I only have a 135x zoom lense on my Canon 80d so capturing detail is nearly impossible. I have posted about the irregular flashing object in the past with no answers. I look up most nights and clearly know the difference between planes, satellites, iridium flares, meteorites, helicopter, etc," another viewer commented. "This is different. It's either incredibly small or very far away. When I view it at night it seems to flash incredibly bright with no pattern. It even fades out into a dull red light occasionally. After a few flashes it always disappears entirely." Added another viewer: "Over the summer, I saw a flashing light just North of Winston-Salem. The flashing light was stationary. I told several people but no one believed me. After several seconds of flashing slowly, it began flashing like a strobe light for about 4 seconds then it stopped. Glad this has gone public. Maybe people will believe me now. " Jones himself is skeptical of the balloon explanation. "If I see evidence that it's indisputable for me that it would be a balloon then yeah I would say it's just a balloon," he said. "But after 10 seconds, I couldn't see it in the sky anywhere. Why would a balloon, if it was just twisting around, why wouldn't I see it again?"